Q: How long in advance do I need to book my shipment? A: We recommended that you book your shipment at least two weeks in advance. Q: How long it takes for my shipment to reach destination via ocean? 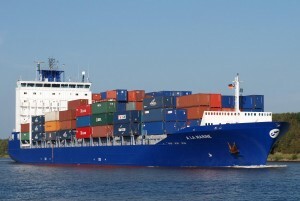 Germany and ports in North Europe transit time is about 3 to 4 weeks when shipping in a container. When shipping to Europe on a Roll on Roll of the transit time is about 4 to 5 weeks. A: All transit times are based on estimates. Many factors go into length of time it takes to reach destination, including high or low season, customs clearance, conditions at sea and other factors. Container are shipped about every week, or more frequently during high season. Customs clearance is done the week the container is loaded or vehicles are delivered at the terminal. Actual sailing time is about 3 weeks. Once at destination, it might take another week to clear paperwork and release cargo. Q: What documentation I need to prepare when shipping cargo? A: Everyone is required to fill out our Shipping Instructions Form. If shipping a car, motorcycle or boat, it is necessary to have a vehicle TITLE (without lien) sometimes a bill of sale is also required. If shipping personal effects, you will be required to provide a packing list, detailing contents of your cargo. We are required to collect your EIN# (for individuals) and/or passport # or Tax ID# (for companies) in order to file the Export Declaration with US Customs. Q: The title of my vheicle is with the lienholder, can I ship overseas? A: Provide a notirized letter from your lienholder granting permission to ship your vehicle overseas. You will also need a copy of the title certified by the state as an authentic copy. If you are a government employee you should also provide a copy of your government orders. Q: The vehicle I purchased has a Manufacturer’s Statement of Origin, can I use this document to export? A: Yes, sumitt the Statement of Origin and the Dealer’s invoice. Q: Can I insure my shipment with you and how much it costs? A: Yes. Please fill out our Shipping Instructions Form and indicate which type of insurance you will require. Te cost will depend on the value of your shipment. Q: Who will load my cargo and can I be present during loading? A: Container cargo will be loaded in our warehouse. You can be present during the loading process provided that you comply with safety instructions. 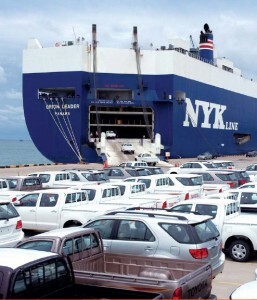 Roll on Roll Off cargo will be loaded at the port of Export and you cannot be present at the time of loading. Container Consolidation services for shipments going to: Bremerhaven, Rotterdam and Felixstowe among other ports in Europe. 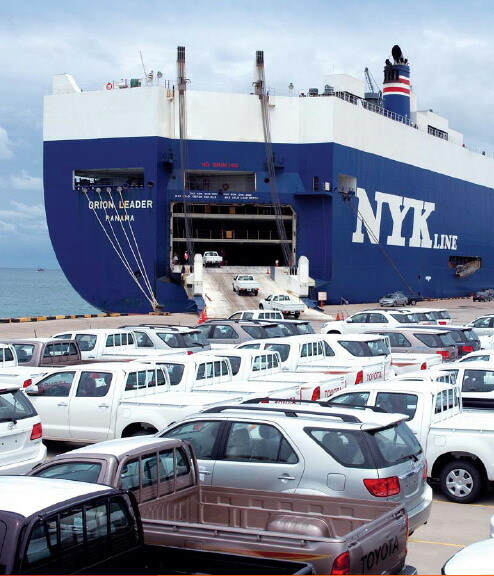 Q: How many cars you can load in the container? A: Depending on the size of your car we can load 2-3 vehicles per container. We can load 4 cars in one container if the vehicles are small. Our loading procedures ensure maximum safety and security for your cargo during transport. Q: How do I pick up my cargo at destination? A: Depending on destination port, you will be given contact info for our local agent, who will guide you through necessary customs procedures and safe unloading of your cargo. Q: Can you deliver container to my address where I would load it? A: Yes. We can arrange container to be delivered to your address and delivered to your final destination. This service is door-to-door. Please contact us for detailed instructions and price quote. Q: What documentation I need to present at destination to pick up my cargo? A: Passport, immigrant certificate, detailed packing list with value of contents. Once we load your cargo, you will be provided copy of dock receipt, along with booking and container number. If shipping auto, upon customs clearance we will mail you back the title. At destination, our local agent will have all information about your shipment. Their may be other items required to pick up depending on the country you are shipping to. Contact the embassy of the country shipping to for more details. Q: Do I pay import duties and taxes? A: You may be subject to import duties, taxes, doc fees, and off loading fees depending on the country and port you and shipping to. Each and every country has different laws so we urge you to contact the embassy of the country concerned to clarify matters. We will be available to advise you on some countries. Q: Do I need a driving license in a foreign country? A: American Driver’s License will be sufficent in Europe. You can drive on your American Plates in a foreign country until they expire, when you will be required to renew your plates in the country of residence.